Hilo is on the northern (or windward) coast of the Big Island. There aren’t many tourists in this area because the threat of rain is too high. Also, there aren’t any real beaches on this side of the island. As we learned during our morning walk, a "walk" on the beach is more like a rock climbing expedition. The rocks in this case are all volcanic boulders and with newer lava flows they are pieces of lava with ripples and swirls baked in just like the icing on the cake. OK, so it’s not fine white sand, but it’s just the kind of thing the kids love to explore. 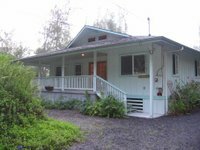 As a place to stay, Hilo has two great advantages: it’s on the water AND within a 40 minute drive of Volcano National Park. For our purposes it’s the perfect mix and it’s a nice contrast to the highrises and thousands of tourists in Waikiki. Driving around in our white rented SUV and carrying cameras and backpacks it’s obvious that we’re tourists, but we like to imagine we fit in with the "locals" a bit better than the tour bus crowd. We all enjoyed breakfast of cereal, eggs, and juice and prepared for our outing to the National Park. The drive to the park winds up route 11 ascending 4000 feet over 20 miles. The interesting thing is this volcano and caldera isn’t either of the highest peaks on Hawaii — the two REALLY big volcanoes (14,000 feet) are Moauna Koa and Moana Loa. They’ve both been active in the past 100 years, they’re not active at this time. We reached the visitor station and took a short tour with a guide along the "earthquake trail". It’s the former road that people would drive on to view the crater, but it got crunched up in an earthquake in the early 80s. The first stop along the path was a geothermal vent. This was fascinating. Perhaps just because it’s the first "volcanic" thing we encountered, and perhaps because it was about 50 degrees and rainy at the time, we really enjoyed standing near the 140 degree steam as it emerged from a rocky hole in the ground. We were prepared for the change in temperature thanks to the guidebooks. We all had sweatshirts and rain coats. Luckily the rain that started at the beginning of the tour stopped within about 10 minutes. The guide pointed out several types of plants and trees — some indigenous and some introduced by well-intentioned park rangers many years ago that are now dominating the local plants. After a slow walk down the road talking about trees and plants, we came to a place where we could get our first good view of the caldera. It was amazing. We initially thought we were seeing the ocean. It was dark and rippled looking on the surface. It’s very similar to the moon and has steam vents billowing up at various spots. It’s about two miles across, although it looked bigger from our viewpoint. We finished up our tour and then did the 11 mile loop around the crater. We stopped at an area that had dozens of steam vents and steam that seemed to just come out of the woods and cliffs on the sides of the caldera. We felt like we were middle of a forest fire, but without any flames. The next stop on our drive was a place where the stove-black lava seemed to be slathered across the side of the caldera. We walked out on the lava and made it back to the cliff at the edge of the caldera. We were closer at this point to a crater inside the caldera that emits sulfuric gas that smells like rotten eggs. We enjoyed throwing the light lava rocks into the wind at the cliff and watching them turn like paper airplanes back toward the edge or just stop in the air. 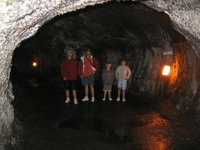 We finished our loop around the crater and ended up at the Thurston Lava tube. A lava tube is perfectly circular cave that is formed when the lava flows as a river and then the top cools and insulates the molten stream inside. Eventually the lava flows out and leaves a circular cave. The Thurston tube is lighted, over 10 feet high in most places so it was an easy walk. At the end we came to a gate the said the tube extends another 300 meters from that point and can be explored with flashlights. We brought our own flashlights but left them in the car. Just as we were about to turn around a nice family leaving the tube offered to give us their flashlights. So off we ventured deeper under the lush rain forest in drippy, dark lava tube. Because we had cheapo flashlights we got a bit nervous about having them turn off. We experimented turning off both lights and the sensation of being in total darkness — literally not a single source of light — was both very scary and cool. It was nice to have the "on" switch ready to click at any time (just to clarify, there were several other groups who came and went as we were exploring; it wasn’t like we’d be left for dead if our flashlights didn’t work). From the lava tube we headed down "chain of craters" road to see the what we were most excited about — molten lava flowing down the hillside into the ocean. We thought it was a six mile drive but it turned out to be a 20 mile drive. When we got there we excitedly asked the ranger where we could see the molten lava and he said that he hadn’t been out to the flow yet that day. 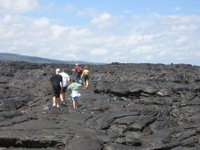 He said the best chance that we’d have of seeing anything would be a 6 mile hike through the lava fields but to be sure that we had three quarts of water per person. We had one 24 ounce bottle for the whole group. Down near the ocean the sun was shining and it was much warmer. We knew then that it was unlikely that we’d see the lava. Nonetheless we hiked out along the access road — the former coastal route — that had been obliterated by the flow in 1990. Even though we had seen the lava fields up near the caldera, these were more impressive. The had the cake-like swirls and were dark black with a glass-like sheen on the surface. We climbed up on to the lava and jumped over cracks and repeatedly had to restrain Roby from jumping and climbing off the path. We followed plastic yellow markers out into the field in the hope that somehow we could see the hot lava flowing or maybe even make it to the lava flow. We could see the huge cloud of steam rising from the ocean off in the distance (in the far distance). We kept going just a bit further — even beyond the marked trail. We made it out about 1.5 maybe 2 miles and decided to turn back. The kids were REALLY disappointed but there wasn’t any indication that we were getting closer to our true objective – hot lava. 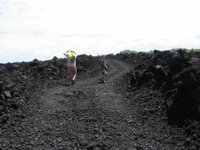 The way back across the lava fields was filled with grumbles from the kids. 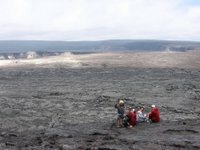 Even though we told them it’s unlikely that we’d see molten lava, they saw the pictures in the tourbooks and the videos and imagined blobs of lava flowing by our feet. By the time we got back to the access road we were all quite thirsty. Fortunately the ranger station had water for sale. We bought two large bottles plus three gatorades and drank them within minutes. 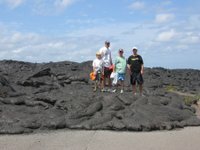 Still disappointed about our failure to see molten lava, we headed back to Hilo. We stopped that store to get food to cook on the barbecue for dinner. Driving out of the store we happened to notice a pick up truck on the side of the road with a "fresh fish" sign. We did a u-turn to see what they were selling. It was a group of rough looking Hawaiians. But when I asked about their fish they opened a cooler to reveal a pile of 30 inch yellowfin tunas. We bought one fish for $10! 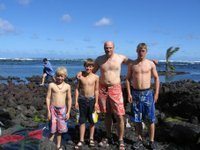 We took the fish back to our house and cleaned it down in the tide pools between the rocks — it was an amazing experience to be cleaning a fresh tuna while the waves crashed around us. The kids enjoyed throwing the left over pieces back into the surf. Ryan explored some of the pools and saw a small clear blob with blue edges. He thought it was something used in fishing but when he touched it stung like a bee. He rushed back to the house and cleaned it. We didn’t know what it was until we looked up some of the "hazards" of Hawaii and learned that it was a Portuguese Man-of-war. Luckily it was just small sting and Ryan felt better quickly. We cooked the tuna steaks out by the pool while Roby and Cal practiced snorkeling. The fish tasted great. It was a fantastic way to end a incredible day. 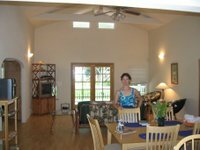 We didn’t want to get everyone too nervous about the unfamiliar setting and people at Turtle Reef condo. It turns out that we’re at the end of road where people come and go – early in the morning and late at night – to fish. The condo itself is amazing. It has three bedrooms. The master bedroom has a king size bed with a master bath. The kitchen opens up into a living room that has a view into the lush rainforest trees and the ocean beyond. The kids have two bedrooms — one with a king and one with two twins. And they have their own bath. The rental car fits nicely in the garage. 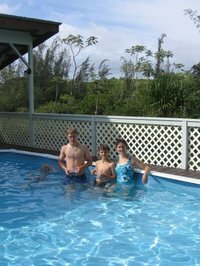 A special bonus for the kids is huge plus a 4ft deep above ground pool with a barbecue grill and a lounge chairs. The setting is really unbelievable. We’re in the middle of thick ferns, orchids and funky multi-trunk trees. There’s even a banana tree right next to our porch. (By the way, this area is the wettest part of the island. In fact, Hilo is the wettest place in the United States. Fortunately the weather changes ever hour and it goes from rain to sun very quickly). The shore is within a few hundred yards of the house. This isn’t a typical Hawaii beach shore; rather, it’s craggy volcanic rocks. 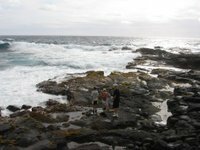 The wind is very strong and the waves are big so it’s amazing to walk along the rocks and explore some of the tide pools and look out into the surf. We’ve even been fortunate enough to see a few turtles swimming in the frothy waves! 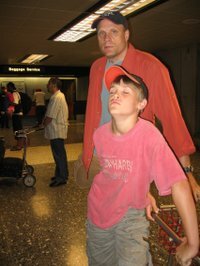 I woke up early (5:30 — but that’s 11:30 east coast time, or course) and headed down to the lobby and got our first entry posted into our summer 2005 journal. Sue went for a run along Waikiki Beach and the kids just frittered for a bit in the hotel room. After we finally got our act together, we had some eggs and pancakes for breakfast at a place along the strip we discovered the day before — cheap, but good. We didn’t have a good idea of what to do with the day. 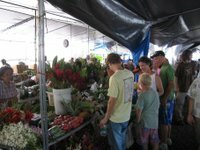 The kids lobbied to head to Hilo as soon as we could but we had already booked our flight for 6:30 that evening. We killed some time shopping at various stores on the walk back from breakfast. We found a place that had a great deal for six tee shirts for $20 so we got several for Cal and Rusty. 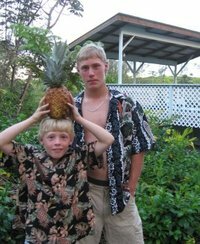 Ryan also found a nice Hawaiian shirt. We packed up and checked out of our room by 11:30 just ahead of the 12pm deadline. We filled our backpack with snorkels and bathing suits and checked the rest of our luggage with the hotel. We then caught a cab for Diamond Head. We weren’t sure what to expect but we knew that it was close enough for a $10 cab fare and for us to be back in time for an early trip to the airport. When we got to the Diamond Head we were more impressed than we expected with the crater and high hills around the perimeter. We hiked up the main trail to the lookout at the top of diamond head. It was about a mile straight up. 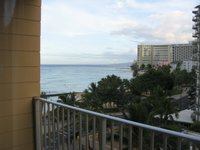 The kids held up well and we enjoyed the view of all of Waikiki beach and the south shore of Oahu. The top was also interesting for the kids because it’s part of a WWII battery with gun turrets and bunkers. Once we got back down to the bottom we enjoyed some shaved ice, hot dogs and hamburgers from "Mr. Magoo’s" vending truck. The food was actually great. The plan was to catch a bus back to Waikiki, but we soon learned that we had to head out of the crater to the main road to catch a bus (about a 1 mile walk). We made it out of the crater and out to the bus stop, but being busy tourists — and recognizing the the $10 fare for a bus is about the same as a cab — we were quick to hail a cab as soon as we saw one. We had planned all along to go for a swim before retrieving our bags from the hotel. The cabbie dropped us off at the old swimming stadium that is now abandoned. He recommended that we go to a beach next to the old dilapidated structure. I (rusty) didn’t realize he was actually doing us a favor and directing us to a secret beach right next to the stadium. I took one look at the changing room which was boarded up and and filled with broken glass and leaves and I rushed the family back down to a more familiar part of the beach where we swam the day before. It turned out that changing in the public showers was a challenged so everyone but Sue went swimming in our shorts rather than bathing suits. It wasn’t really worth the trouble. The surf was very rough and we couldn’t do much more than attempt to body surf a few waves without cutting our feet on the sharp reef. We retrieved our bags, changed in the hotel rest room and headed for the airport just after three. Our hope was to catch an earlier flight than our 6:30 reservation and avoid the $25 per ticket change fee. We thought we’d catch the 4:15, but we ended up on the 4:35 (flight to Hilo run frequently). This turned out to be a huge plus because the two hours was used up getting our rental car and finding our condo. We didn’t plan very well. I guess we just expected the condo to be on a well marked road. Well, it turned out that the condo is in an area that has three main road and about 50 secondary roads that are red dirt (lava). After making a few wrong turns we finally found the condo at the end of Makuu road. It was a bit scary because it’s literally at the absolute end of a long dirt road near the water. At first we overshot the entrance and ended up in a place with a creepy guy sleeping in a van. Then we backed up a few hundred feet and found our condo. The condo itself is beyond all of our expectations: three bedrooms, a new kitchen a great living room, mud room laundry, garage, and lainai (porch). It’s beautiful but the guys parked in the woods nearby got us a bit nervous about the neighborhood. We made sure that the doors were all locked and we went to sleep with the sound of waves crashing in the distance. The taxi to Pearl Harbor cost $40 from Waikiki so we decided to economize and take the bus back home. I shouldn’t say "we" because I protested the time it would take and thought the $30 we’d save wouldn’t be worth an extra hour of winding through various neighborhoods of Honolulu. It actually turned out to be a nice time to just sit back and talk. We even met some interesting people. Ryan and I sat next to a guy from Kenya who is going to school in Hawaii to get his business degree. We talked for a while about his life in Kenya and what he hopes to do with his education. He was one of these people who just seemed genuine and kind. After about 30 minutes I asked him where he was headed and he said Downtown Honolulu which I realized we had passed about 10 minutes earlier. He said that it would have been considered rude to interrupt our conversation and he explained that people are always too busy racing from place to place just to talk. (Boy did that make me feel shallow for arguing to take the taxi). We finished up our conversation and he got off the bus and headed the other side of the road to catch another bus back to where he actually wanted to go. 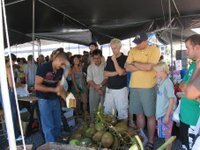 We also met a guy from Boston who had just arrived in Honolulu two weeks ago. He just decided after 5 winters in Boston that he wanted to move somewhere nice. 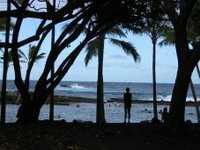 He had never been to Hawaii, but just got on a plane, found a place to live, found a job and was already enjoying life in the much more accommodating climate. 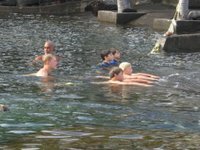 When we made it back to our hotel, which is 30 feet from Waikiki Beach, we were excited to see hundreds of people swimming, snorkeling, and diving off the breakwater into the surf. We ran up to the room to get our masks, fins and snorkels. In just a few minutes we were jumping into the waves and looking down at hundreds of colorful fishes. Roby was especially into it. He saw several fishes just like "Scar" from Finding Nemo. We also saw puffer fish, large green fish with a bump over their nose, and lots of tiger striped fish. We were surprised at how salty the water is and how close the jagged coral reef is to the surface. Ryan scraped up his foot and Cal got too much salt in his eyes so they didn’t last quite as long as Roby, but we all had fun. After showering for dinner, we were eager to find a good sushi or fish place. We figured we had seen all these great fish, we might as well eat some. When we asked the Concierge for help we noticed the buffet at the hotel had king crab legs, clams, salmon and other great stuff. It was a bit pricey, actually very pricey, but after looking at few other restaurants in the area we decided to splurge. We rationalized it in part because of all the money we saved taking the bus back from Pearl Harbor. In the middle of the restaurant is a huge aquarium with many of the same fish we had seen snorkeling but also had two large Manta Rays and some sharks. A woman was feeding the fish while we were eating. Sue and I got the house special drink which was a hollowed out pineapple. It came sitting in a dish of dry ice so it had a great effect of smoke bubbling up around it like a volcano. We all stuffed ourselves. We could barely walk, but decided to take a quick stroll down the beach just to see the scene. They were showing a moving on a huge screen down the beach and people were still surfing and swimming. Not that this is any surprise, but we’re realizing that in Hawaii they really do LOVE to surf. We all collapsed at 9pm and fell asleep quickly. The Pacfic Beach hotel turned out to be nicer than we expected. And they didn’t give us any hassle for having 5 people in a room that was only supposed to have two adults (a source of some anxiety as we approached the hotel. It was a bit odd to tell the kids to "spread out and lay low" as I approached the front desk). We ended up with a nice room with two double beds. Roby slept on the floor in our ultra compact sleeping bag that we brought from last year’s trip. We all got at least a few hours sleep on the flight in. Ryan was hungry when we got here so we went out and bough some ramen noodles at a local convenience store for him to make in the room. 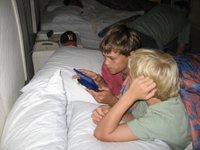 After a bit of muching, we were asleep by 1am Hawaii time and slept in until about 6am. After getting some muffins and amazing pineapple juice we took a taxi to get to Pearl Harbor, actually the Arizona Memorial, early. All the guide books stressed that we’d need to arrive early. We got there about 8:30 and the line was about 400 yards long! It twisted and turned in the large grass area leading up to the entrance. Luckily it moved reasonably fast and we got in about 9:30. Then we learned that we were part of the 11am tour. After grumbling a bit (Rusty that is, not Sue), we listened to the audio tour for an hour and rested on the grounds for 30 minutes and then got on the shuttle out to visit the memorial. It was sobering to think of all the people who lost their lives at Pearl Harbor and on the Arizona specifically. 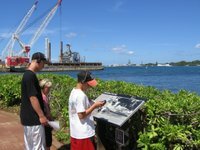 The kids were very engaged too in part because we rented "Tora, Tora, Tora" and "Pearl Harbor" a few weeks ago. They could imagine the Japanese planes strafing the airstrip and bombing the boats. The good news: our plane left on time from Boston; we had a 90 minute layover in LA and enjoyed a dinner at Chili’s; our plane left on time in LA; and we arrived in Honolulu at exactly 10:30 local time. Even more good news: we go out bags first, hopped into a SUV van that fit us all easily and got us to the hotel by 11:30. We’re grateful for that and realize we should never complain about air travel that goes well. On both planes — I guess in order to accommodate a family of 5 in one row — we ended up in the absolute LAST row. This wasn’t so bad in the 28th row 737 that we flew from Boston to LA, but was especially disappointing on the 35 row 757 that we flew from LA to Honolulu. It was great for peole watching as we got to see everyone 2 or 3 times during the flight as they took their bathroom breaks. Even more special is that we got to HEAR everyone 2 or 3 times as they took their bathroom breaks. Actually all we could really hear was the distinct WOOSH as the plane’s toilet flushed. I’m not sure why, but some people would decide to flush after they opened the bathroom door. That was the most impressive. We also got to hear the chatter of the flight attendants as they prepared food and snacks for everyone. It was a bit distressing to hear one of the flight attendants go "shush, listen. Doesn’t that sound like we have a flat tire?" As we were taxiing out onto the runway for take off. Anything else we can do to make your flight more enjoyable???? We’re going to recycle this same journal that we used last year. With luck we’ll be able to post some pictures and updates on how we’re doing as we venture even further out into the blue pacific. If this is a trend, perhaps next year we’ll end up in Tahiti, Japan or New Zealand. (Or perhaps we’ll stay in Wayland and paint the house and put up wall paper).